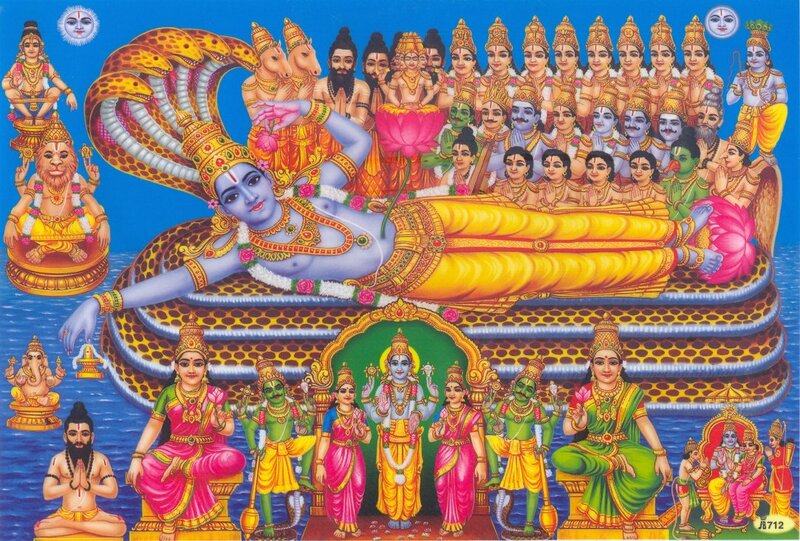 In this Part we will explore the meaning of the Thirteenth Shloka of Sri Vishnu Sahasranamam. Bhagavan brings tears of joy to his devotees. 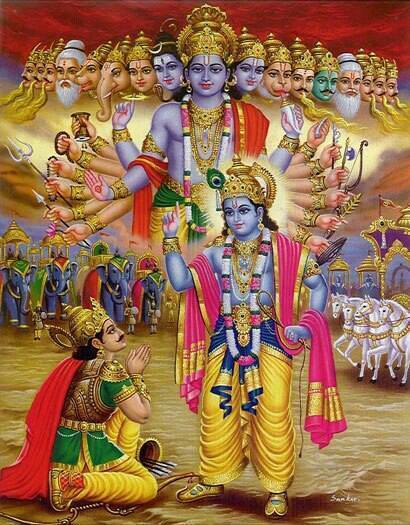 He is multi-headed with eyes, ears, hands and feet in all directions and HE supports the earth in his AdiSesha form. He is the root cause of the Universe and one who has divine ears that hear all things Pure. 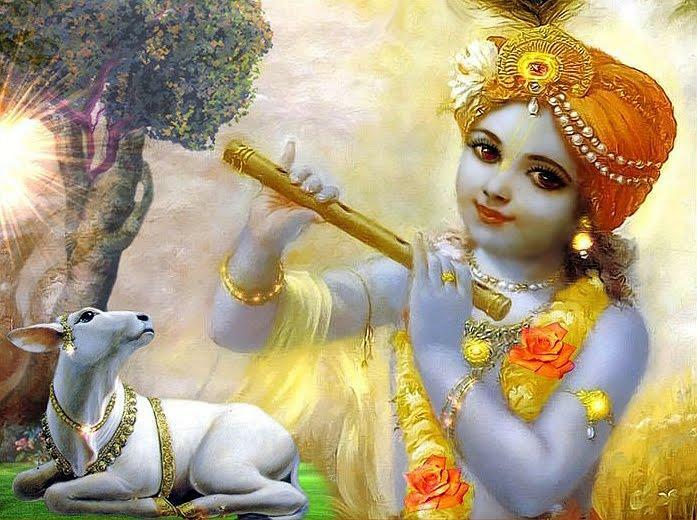 He is insatiable nectar to his devotees and is eternally firm. He is the Supreme Object of Attainment and He is endowed with great knowledge. The other way of interpreting this is “Rudam dadaati iti Rudrah– He confers good things” or “Ruh draavayati iti Rudrah – He eliminates devotees’ miseries.” Shiva Puraana says “RurDuhkham Duhkhahetum vaa Tad Draavayati yah Parabhuh, Rudra ityuchyate Tasmaat Shivah Paramakaaranam – He is called Rudrah because he liquidates all our sorrows and their causes.” Sri Adi Sankara further explains that ‘Rud’ means ‘good’ and ‘Ra’ means ‘one who confers’ and, hence Rudra means one who confers good. It’s very interesting to note the Namas generally attributed to Shiva such as Rudra, Sthaanu, Eeshaana and even the Nama Shiva also appear in the Vishnu Sahasranamam. The converse is also true. In Sri Rudram we have a line saying ‘Om Namo Bhagavate Rudraaya Vishnave Mrityur me Paahi’ where Rudra is addressed as Vishnu. It goes to show the basic underlying unity of Hari and Haran. Sanjaya says that Arjuna witnessed the Viraat rUpa of Bhagawan which had countless faces looking in all directions. Meaning: I see your endless form everywhere with countless hands, heads, stomachs and eyes. I see you with no end, no middle and no beginning’. 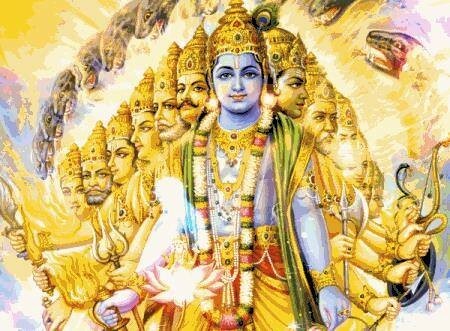 Sri Parasara Bhattar has interpreted the Nama as referring to the form of Bhagavan as Ananta, in which form He has many faces and over a thousand hoods. Again in Chapter 13, we have “sarvatah paaNi paadam tat sarvato’kshi SirO mukham – The Pure svarupa has hands and legs everywhere, has eyes, heads, and mouths everywhere”. He as AdiSesha supports the earth. He is also the supporter of the Earth as Adi Kurma, Adi Varaha, etc. b) He is the One who unites His devotees with Himself. Yoni means ‘Cause’, since He is the cause of this world He is called Visvayoni. In The 89th nama – Visvareta – we saw that He is the seed from which the world originated. This Nama says that He is also the place where the seed develops into its full blossom. Yoni means womb, and He is the seed, the womb, the Sustainer after the birth of the world, the one who impartially observes as the Kshetrajna or skilfully cultivates. The word Yoni is derived from the word yu which means – to unite (yu miSraNE). Thus Yoni can refer to Bhagavan’s act of uniting His devotees with Him. 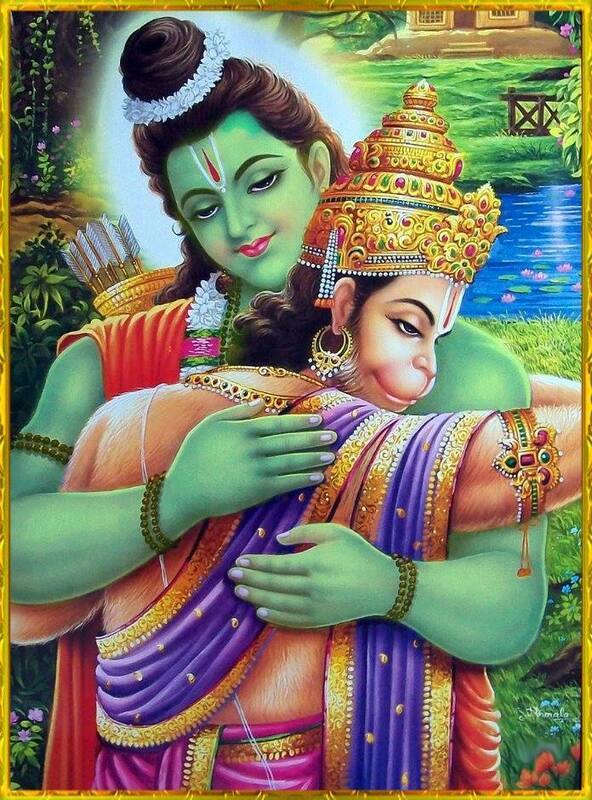 When Hanuman came and confirmed that he had sighted Sita, Lord Rama was so happy that he gave him a tight hug! Thiruppaan was found in a paddy field in Woraiyur by a couple from the ‘Paanar’ community. The childless pair cherished his arrival and brought him up with much love and care. Paanars’ are a community of musicians and traditional song makers who are capable of moving their audiences to states of ecstasy and bliss. 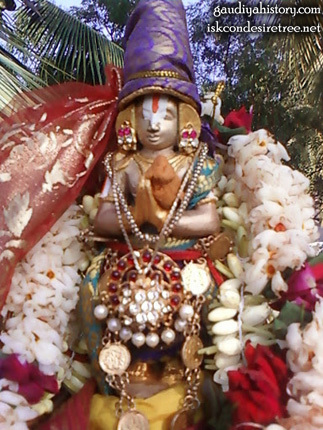 Thiruppaan is believed to be an avatar from Vishnu’s chest known as Srivatsam (legend has it that all azhwars are avatars of some part of Vishnu). Being a divine child, his instincts were heavenly and he grew as a man uninterested in all the glamour of the world. Having a veena in his hand, he was always seen singing glories of Vishnu. He was soon famous in and around villages of Southern India. His skills as a bhakti (divine) musician and his abilities to express that invoked bhakti amongst his listeners, drew audiences from afar. He was soon to be known as “Paanar Perumal”. The Paanar Community was considered as outcastes. One of the strictures on them was that they were not allowed to use the shores of Cauvery River, considered sacred and pure by the higher caste people of the region. Following this stricture, Paanar Perumal did not come near the Cauvery River, but mostly stood alongside its banks facing the Srirangam temple and sang in praises of Lord Ranganatha. One day, a Sage by the name Loka Saranga came to the River Cauvery for drawing water for the temple. 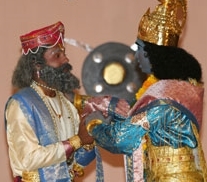 Paanar was in deep devotion and was unaware of his surroundings that he missed the voice of Loka Saranga asking him to move away. The sage threw a small stone in his direction to wake him, but the stone accidentally hit the forehead of Paanar and he started to bleed and he retired quietly. Unaware of the injury caused to Panaar, the Sage returned to the temple. He was taken aback on seeing blood oozing out from the forehead of the idol of Lord Ranganatha. That very night, the Lord appeared in the dream of Loka Saranga and commanded him to bring Paanar to the temple on his shoulders the following morning. Accordingly, Loka Saranga requested Paanar to come to the temple on his shoulders. But Paanar, referring to his lowly birth, declined to go along. When he was told of Vishnu’s command, Paanar agreed. 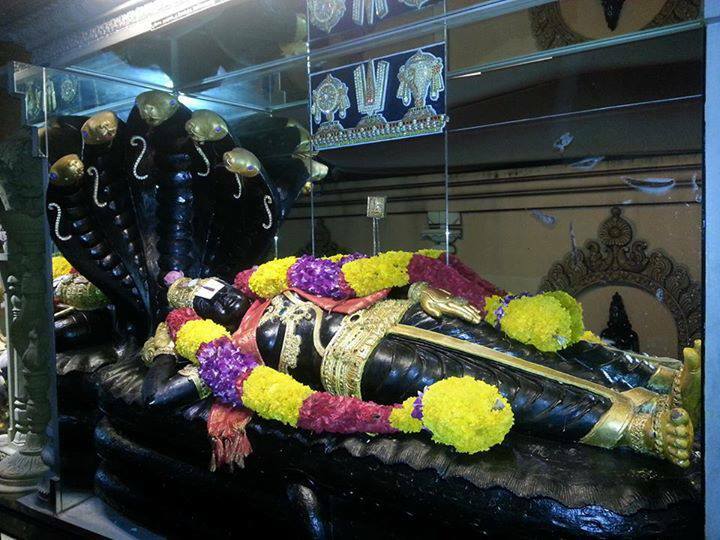 When they reached the sanctum, Paanar experienced the bliss of Lord Ranganatha and composed the AmalanAdhipiraan comprising of 10 Pasurams or verses describing the beauty of the Lord Ranganatha from the Lord’s Lotus feet to his divine head and ultimately laid his life at the feet of the deity. vandhu en Kannin ullana okkinrathe. Meaning: He is the Lord of Arangam surrounded by lofty walls. O, his auspicious Lotus feet have come to stay in my eyes. 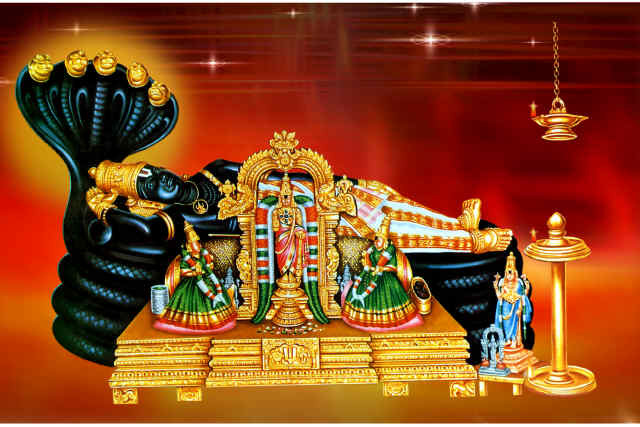 He then proceeded to describe the whole body of the Lord and sang a total of ten Pasurams (or hymns) which described in detail the beauty of the Lord Ranganatha from his Lotus feet to his Divine head. And finally after completing the verses, Thiruppaan Azhwar fell down and laid his life at the Lord’s feet and attained liberation. He became a part of the Lord along with his mortal sheath. His principal purport in them is: “Perumal is the principal supreme entity and our aims and aspirations should be to attain Him through total surrender to him signified by our placing all of ourselves at his lotus feet”. Without the Lord’s will, no one can be united with Him. He is Visvayoni because He unites His devotees with Himself. “O Dhananjaya! I listen here to all that is pure and agreeable to hear. I do not heed to what is sinful. Therefore I am known as Suci-Shravaah”. c) The word Sravas also means ear. Swami Chinmayananda interprets this Nama as meaning the One who has divine ears – He is the Hearer of all ears. Amrut means nectar and the Bhagvan is the the unsatiating nectar to His devotees. He is also Amrita or nectar to his devotees giving joy and sustenance to them. It is said of Valmiki that – “Yah Piban satatam Rama Charitaamrita Saagaram Atriptas tam Munim Vande Praachetasam Akalmasham – Salutations to Sage Valmiki who is never satiated even after constantly drinking in the Amrita of Ramakatha’. The devotees never get satiated by doing service to Bhagavan, and He is limitlessly sweet to the devotees. Another meaning for Amrutah is that He is immortal. na vidyate mritam maraNam asya iti amrutah – He has no decay or death. The sruti says He is non-decaying and Immortal – ajarah amarah – (Brihadaranyaka Upanishad 4.4.25). Swami Chinmayananda says that He is Amrutah because He can cure the disease of ignorance in His devotees. This Nama has appeared earlier in two parts as Sasvata and Sthanu separately as the 57th and 28th Namas. Sthanuh was earlier interpreted as the One who is firm in blessing His devotees, and Sasvata was interpreted as the One who is Eternal because of His unceasing act of creation, sustenance and destruction. Sri Parasara Bhattar gives this Nama the meaning ‘Eternal and Steady’. Unlike the nectar for which the Devas and Asuras churned the Ocean, He is Eternal because he cannot be taken away from those who enjoy Him. Sri Adi Sankara gives the meaning that He is “Eternally Firm”. Sri Radhakrishna Sastri gives the interpretation that He is Sasvata because He has no beginning or end, and Sthanu because He does not age or decay. b) One who is of ‘Excellent Ascent’. Varam means Supreme and Arohanam means ascent. Sri Parasara Bhattar’s interpretation is that He is the Supreme object of attainment and all other objects are inferior. Sri Adi Sankara gives the meaning that He is of ‘Excellent Ascent’. Sri Radhakrishna Sastri suggests that Bhagavan is Vararohah because He is reclining on AdiSesha, the high paryanka. Sri Parasara Bhattar interprets the first 122 Namas as describing the ‘Para’ form of Vasudeva, which is not conditioned by any limiting adjuncts and is endowed with the six qualities of Gnana, Balaa, Aishvarya, Veerya, Shakti and Tejas. This is the object of attainment of the released souls. The transcendental nature (paratva) of Bhagavan has been spoken of mostly by the names ending with the above nama – Vararoha. 2) kim vApi ekam parAyaNam? What is the highest goal in life? Vasudeva can be taken as having been included in the ‘Para’ form. The ‘Vyuha’ forms are in charge of the work of Creation, Sustenance, and Destruction; they propound the Sastras, explain their significance, and give the fruits in accordance with the rules laid down therein; they also teach the method of meditation and worship of Bhagavan. The six qualities of the Para roopa are distributed amongst the four Vyuhas (Vasudeva, Samkarshana, Pradyumna and Aniruddha) and each has its own form and duties. They are the means for the attainment of salvation. The Samkarshana form is associated with knowledge and strength. Starting with the next nAma, the Samkarshana form – the second in the Vyuhas – will be covered. Mahatapah means the One who is endowed with great knowledge. Tapas generally means penance and it also means Knowledge. Supreme penance leads to ultimate knowledge and hence the two are synonymous in essence. In this context Sri Adi Sankara interprets this Nama as ‘Mahat srijya vishayam tapo jnaanam asya iti Mahaatapaah – He has the Supreme knowledge of creation hence he is Mahatapah’. This is also reflected in the Mundaka Upanishad which says ‘Yasya Jnaanamayam Tapah – Whose tapas is the nature of knowledge. Bhagavan brings tears of joy to his devotees, hence He is Rudrah. He is multi-headed with eyes, ears, hands and feet in all directions, so He is Bahushirah. He supports the earth in his AdiSesha form, hence He is Babhruh. He is the root cause of the Universe, so He is Vishvayonih. He has divine ears that hear all things Pure, hence He is Suchishravah. He is insatiating nectar to his devotees, hence Amrutah. He is eternal with no beginning or end and has no decay, so He is SasvataSthanuh. HE is the Supreme Object of Attainment, so He is Vararohah. He is endowed with great knowledge and hence He is called Mahatapah. Reblogged this on Author Sondeep Vermma. There are around 11 versions of Shiva Sahasranamas, in which two (one from Mahabharata and the other one from Linga Purana) are the most popular. Shri Ramani is referring to the Mahabharata version. Yudishtra after hearing the Vishnu Sahasranama from Bheeshma requests him to also teach him the thousand names of Lord Shiva. Bheeshma expresses his inability to do so and requests Lord Krishna to teach it to Yudishtra. Then Lord Krishna who has learnt it from Sage Upamanyu teaches it to Yudishtra. Very interesting. However no well known commentaries appear to have been written on this! Thank you for that explanation as I wasn’t aware of this. Interesting! In capturing the virtually uncapturable Infinite, our preceptors seem to have offered a range of paths, calibrated to individual levels of maturity and even preference. Such paths are useful. In pursuing them, caution not to mistake the journey (exhilarating as it would be for the ardent devotee) for the destination: hence I think the emphasis on the underlying indivisibility of the Parabrhman, explained in regard to the namas ‘Rudra’ etc. Interestingly, in the Siva Sahasrama Nama revealed to us by Lord Krishna himself (as part of Mahabharata) the name Hari refers to Shiva repeatedly! Hello sridhar acharya ji good day to u. Ur description of shlokas from vishnu sahasranama is too good. 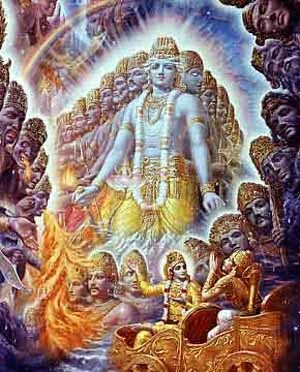 The epics related to lord vishnu u potray are interesting to read and ur comentry on this is also nce. A nce job u are doing to take people to a spiritual world where all moha maya are left here in this materialistic world and our good deeds are counted. Thanks sridhar for this..